Little Brian Stelter Complains Trump Talks to Press Too Much! Well, they do have access. Trump stops and talks to them wherever he sees a pack of 'em gathered. Now, he may not accept every interview request, which they would define as access. But they cannot say that Trump is hiding from them like Obama did. And Obama wasn't hiding; he just thought the media was a bunch of pack rats that he didn't want to descend to be able to say level. I mean, he knew they were on his side, but he knew that they were fools. He knew that he owned 'em. He knew that he had the media wrapped around his little finger. They thought Obama loved him. They thought that Obama thought they were cool. They thought that Obama thought they were his equals. Obama never thinks anybody is his equal, especially the media. Socialists and people prone to tyranny detest the media in terms of lack of respect. But the Drive-Bys think Obama respected 'em and loved 'em. But he didn't. So he didn't give them the time of day. And when he did, it was looking down his nose. But they didn't care because Obama was hip. They didn't care because Obama was cool. They didn't care because Obama was wiping out the Republicans. Except he wasn't. (laughing) Obama was enabling the Republicans to wipe out the Democrats, as we discussed in great detail yesterday. RUSH: So now we go to Little Brian Stelter at CNN, sound bite No. 1. This was... Actually, it was Sunday morning. I guess I was mistaken. I thought it would’ve happened yesterday. Sunday morning on his program Reliable Sources talking about Trump. 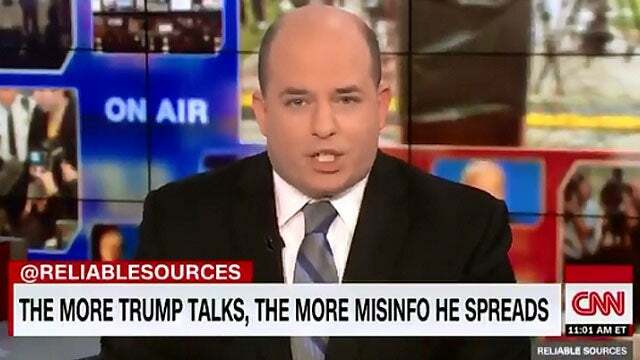 STELTER: The president of the United States is the country's biggest promoter of misinformation. And he's been in awfully chatty mood lately, super talkative, holding presses and Q&As, interviews and chats on Air Force One. He called in to Fox News one night this week and then woke up and called in again the next morning, and the result is even more pollution in the air and on the air. I wish this weren't the case. I wish the fact-checkers weren't working overtime on his comments. RUSH: He says that Trump's media appearances sow confusion and division 'cause Trump lies all the time. STELTER: It's usually and definitely a good thing for the press to have more access to powerful people but with Trump the downside of that access is that he's saying so much stuff that's untrue that it sows confusion and division. That's what USA Today did by running this presidential op-ed the other day full of distortions, and that's what Fox & Friends did by putting Trump on the phone for 46 minutes and then not correcting many of the errors. RUSH: This is incredible! Little Brian is speaking for all of the media. What he's saying is, "Damn it. Damn it. We can't find a way to tell people how Trump's lying and spreading misinformation. He's not giving us a chance to do our jobs." He's expressing frustration that Trump is sucking all the oxygen out of the room. Never have I heard this before. 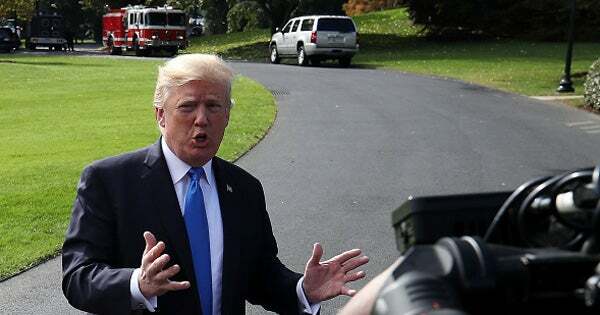 The Drive-By Media whining and complaining that there's too much access, the president's talking too much because he's lying and spreading lies. And he's not giving the media enough time to fix it. RUSH: Here is the president himself. He was on Stuart Varney's show, the Fox Business Channel today. And Stuart Varney... In fact, they had.... It was a cabinet meeting at the White House today, and Trump made available all of his cabinet people to do little interviews with Varney on the Fox Business Channel. Mick Mulvaney was there, he’s always great. Kudlow is always great. And it was a well-structured and presented segment. 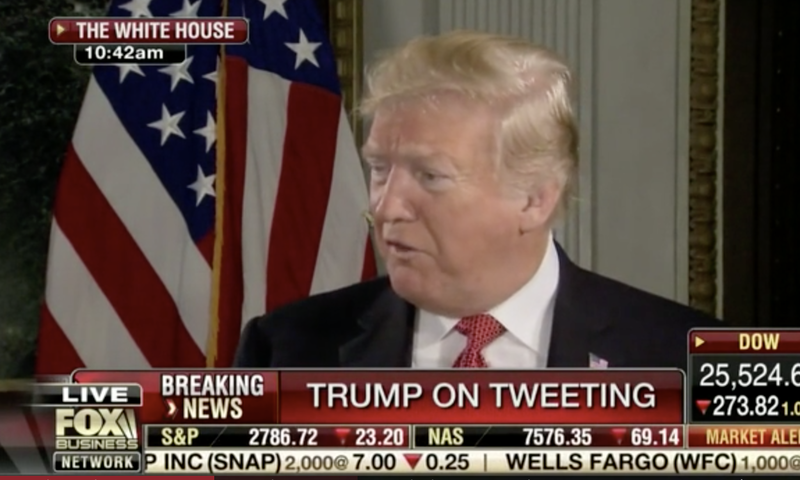 And Varney said to President Trump, "Does anybody ever say to you you're doing an awful lot of media? Anybody complain you're doing too much media? Do you like it?" THE PRESIDENT: I don’t like it. I like getting the point across. I've heard you say many times that the economy isn’t covered properly. And it's not. That the economy is not covered properly by the so-called mainstream media. And it isn't. We went up almost 600 points yesterday, and they didn't even have it on major news. You couldn't find it anywhere. And the economy is doing probably better than it's ever done in history, and they don't even talk about it. And that's because they have their opinion and they'd like to keep their opinion going the way they have it. They do not treat us fairly and therefore, if I do the news, they all want me on the news, so I can talk about it myself. RUSH: "And what about the tweets and so forth, these people that say we don't want any more tweets? Anybody ever try to tell you to stop tweeting?" THE PRESIDENT: No. And I don't think I'd be talking to you if I did that. It's a way of getting out the message. Look. We have fake news. Everyone's fake. And I'm not saying you and some of the people on Fox, not all of them, but some of them. But there's so much misinformation being put out. That's my only form of communicating, really, other than having a press conference every hour. I don't call it tweeting. I call it social media. We're definitely getting the word out. We have the greatest economy in the history of our country, and it's not being reported. RUSH: There you go. It's that simple. He's the only way he get his message out. He's not gonna stop, he loves it. And the fact that they're getting frustrated and CNN's media, whatever guy saying, (impression) "It's too much talking! The president's it's just too much media! It's too much, he's gotta stop polluting the country!" And so they're so frustrated they can't stop him, folks.